How do I create new evaluation? On this step user can choose the future appraisee by clicking the arrow. by department - search through employees of specific department. all - simple search throughout all of the company employees. *NOTE: For evaluation you can only choose one appraisee at a time! You can remove the selected participants and replace them with others by clicking cross. At this step you can also attach any useful files such as documents, picteres or anything that might be helpful during the evaluation. the attached files are visible for all the evaluation participants. On this step user can choose who should give feedback, which evaluation step should be open for participants. By checking boxes participant will get access to information in that step. *NOTE: If Facilitator unchecks all checkboxes (access) for appraisee then he won't be able to see any step of evaluation! The facilitator usually is set as a users manager, but in case he is just a creator and is not supposed to take part in evaluation, he can be removed and the real user's manager can be put here instead of him and then his answers will be counted in statistics. IMPORTANT: Depending on how you group the respondents on this step, after evaluation you may get the report results in different representation. The results are usually grouped by user type. So according to the example in the picture the manager result will be displayed separately and other three users' results grouped together. On this step user can build your form from scratch using a form builder library to the left or use a previously constructed evaluation templates available to you which can be used without changes or altered. Click 'Use this template', then you can view it or edit if needed. It is also important to edit title and description, cause this is the info which will be visible to participants in the invitation emails they get. After this 'Save&next' to proceed. On this step user can choose if the evaluation process should be followed by appraisal meeting or not. Choose the option using the radio button and click 'Save&next' again. If user choose option "Setup evaluation meeting" next step would be Meeting and you will have to choose the template for the follow-up appraisal meeting. If user choose option "No meeting needed" next step will be skipped an you will get to the Dates Step right away. 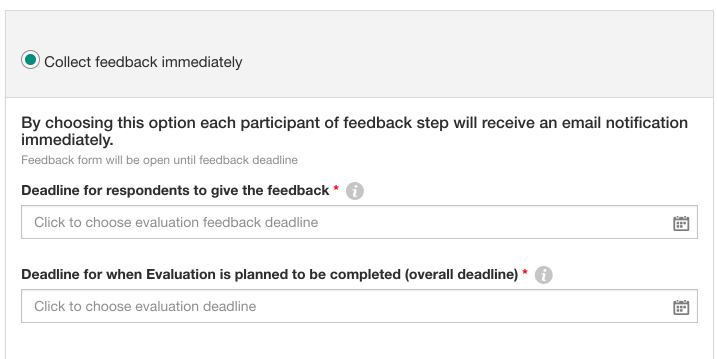 On this step user can choose when feedback form should be sent and when is the deadline for appraisal meeting. Here you choose when the process should start. By choosing date and time you will control when feedback forms are sent to all parties and when evaluation must end. 1. Collect feedback immediately - in this case an email notification will be sent to everyone involved right away. Deadline for respondents to give the feedback - date when the feedback form will no longer be available for respondents and no more entries can be made. Deadline for when Evaluation is planned to be completed (overall deadline) - date when the whole evaluation should be over and the feedback to apprisee must be given. Start date - date when the feedback form will be sent to all the participants. Time is optional. Input the required fields and click Save and finish. Evaluation will be in DRAFT status until start date. Invitations to respondents will be send at specified date. Evaluation can be forced to run at any time from summary page by manager or the user with admin rights. Good luck with building up your evaluation!